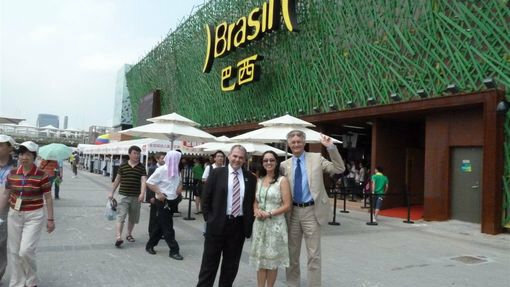 On the morning of Wednesday, July 20, Bernard Weber and New7Wonders Director Jean-Paul de la Fuente were the guests of honor at the intriguingly designed Brazil Pavilion. 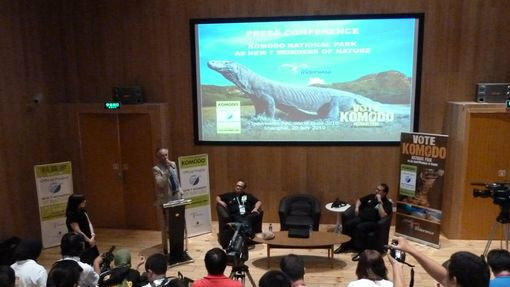 During a fascinating talk on the Amazon and Iguazu Falls, Pavilion Director Petro Wendler shared a variety of very interesting stories about real people with the audience of mostly Chinese journalists. These stories truly brought these two fantastic N7W Finalist Candidates to life. The presentation was followed by online voting in the press room, where Petro, together with Argentina’s counterpart Esteban Zubizarreta, cast their votes. We are willing to bet that they both voted for Iguazu Falls, which straddles the border between their two countries! An exquisite luncheon with typical Brazilian food and flair was then served in the elegant Pavilion dining room, to which some appropriate guests were invited, such as Colombia Pavilion Director Juan Pablo Cavelier — Colombia is also one of the 9 countries that share the Amazon. One of the impressive attractions at the Brazil Pavilion is a high-tech, multimedia exhibit about Brazilian life and work, and about its many natural resources. 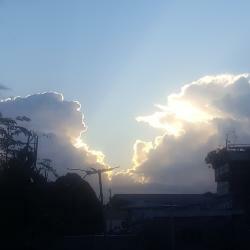 In the afternoon, the New7Wonders team was chauffeured in an air-conditioned car (a relief from the humid heat outside!) to the Indonesia Pavilion for a truly spectacular event. To start, an official photograph was taken in front of this monumental Pavilion, together with Director Widharma Raya Dipodiputro and Sapta Nirwandar, Director General of Tourism Marketing of the Ministry of Culture and Tourism, who delights in being one of the main people responsible for the Komodo New7Wonders campaign. A large group of children, all of them real New7Wonders of Nature champions, welcomed Bernard Weber and Jean-Paul de la Fuente warmly with a traditional music and dance performance. Visiting this majestic Pavilion built of bamboo was one of the most exiting experiences of N7W at Expo 2010. Its voluminous space and many floors made for an exceptional 3D experience and, compared to many other Pavilions with lots of electronic and media displays, this is the “Louvre” experience of Expo. The Indonesians brought so many artifacts and other great handcrafted displays, ranging from an infinite variety of instruments and masks to hundreds of rice-harvesting knifes that look like little sculptures of birds, that a visit to this Pavilion is really like a visit to a very lively museum. 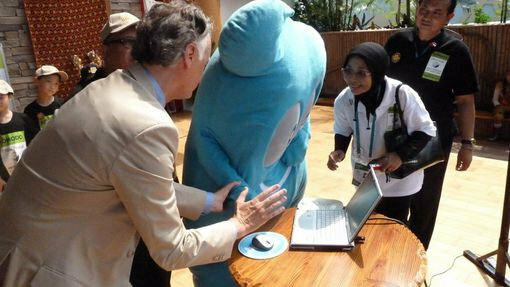 "Haibao", the Official EXPO 2010 mascot, tries his hand at democracy. For the grand finale during this last National Pavilion visit, “Haibao,” the Official EXPO 2010 mascot, also cast his vote in the New7Wonders of Nature campaign!